We are actively engaged in offering Sella Cream White Basmati Rice. 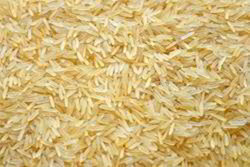 Our offered rice is grown under favorable climatic conditions using natural fertilizer and is widely popular due to its amazing taste and fragrance. Clients can avail this offered basmati rice in desired quantities and moisture-proof packaging options. Looking for Sella Basmati Rice ?